One of the things I spend far too much time doing is checking out different cooking blogs on the web. There are lots of great ones available and my live and obssessing over these blogs is probably one of the main reasons I started this blog in the format I have. 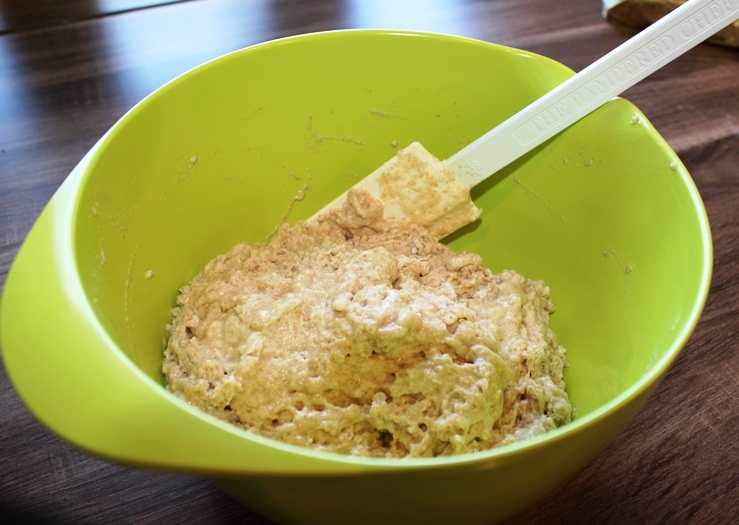 I recently stumbled across a great blog called Cookie Monster Cooking that I am loving. The next two recipes I share are both inspired by this blog. One thing I had always loved from Tastefully Simple when I was in the US was their beer bread. As I am most certainly not a baker, it was something so simple even I could master it! I was in such a rush when moving that I did not have a chance to order any and so have gone without since I moved. I don’t know how I have possibly survived! I then stumbled upon this post on the Cookie Monster Cooking blog and instantly knew I needed to try it. 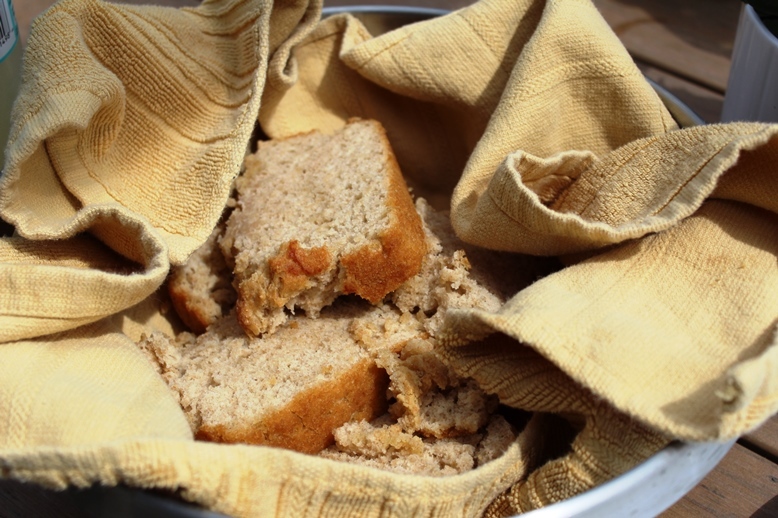 I happened to have some whole wheat flour and decided I would make ‘healthy’ beer bread. It turned out great! To start, preheat your oven to 350 degrees Fahrenheit in the US, in Germany to 165 Celsius on Umluft. Combine the beer and the honey in a small bowl and stir to combine. I didn’t do this the first time around and it was then hard to stir the honey in when combining all the ingredients. I regretted it. Learn from my mistakes! 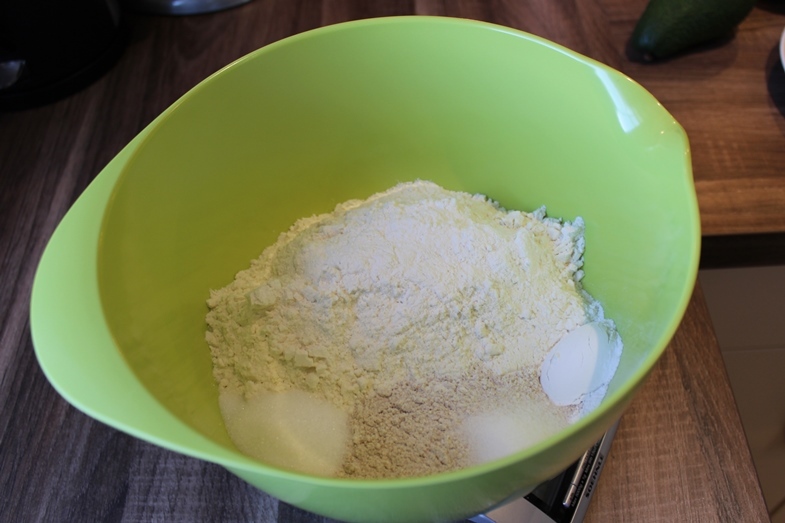 Then, in a larger mixing bowl combine all of your dry ingredients. You certainly do not have to use the whole wheat flour as the recipe that inspired me did not, but I figured a bit of fiber here would be a good thing! Stir up the dry ingredients until they are well combined. 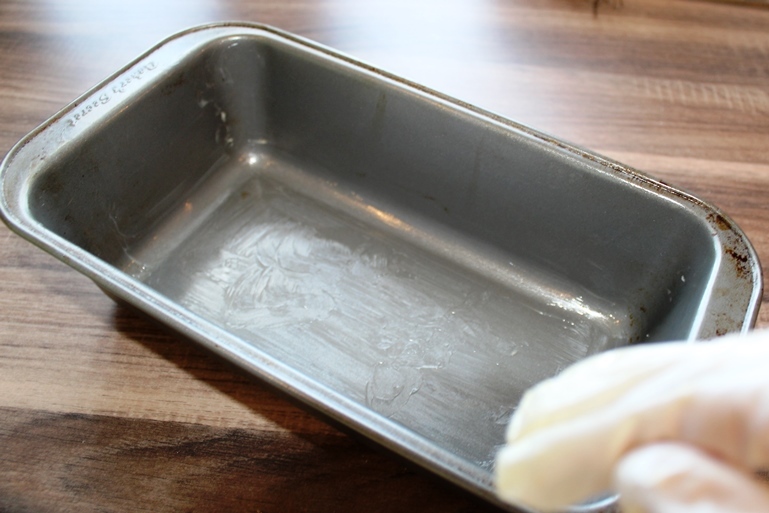 Grease up a loaf pan with some butter. I use a rubber glove…it’s much easier. Melt the butter by either sticking it in your oven or in the microwave. Don’t be silly like me and forget to cover it with a paper towel in the microwave. That is, unless you have a desire to clean your microwave later! Then spread out the batter in the pan evenly and pour the butter over it. Bake in your oven for 50-55 minutes (possibly less here in Germany…I am still trying to figure out the best settings for my oven here when baking!). You want it to have a nice golden brown color on the top. When it is done, remove it from your oven and cool for 5 minutes in the pan. Remove it, then leave for another 5 minutes before slicing. I highly recommend schmearing honey butter all over this before eating! And yes, I know schmear is not a word but I have always felt smear should be prounounced this way. I am weird, what can I say? Enjoy! Preheat your oven to 350 degrees Fahrenheit or 160 Celsius on Umluft depending on your continent. In a small bowl, combine the beer and honey. 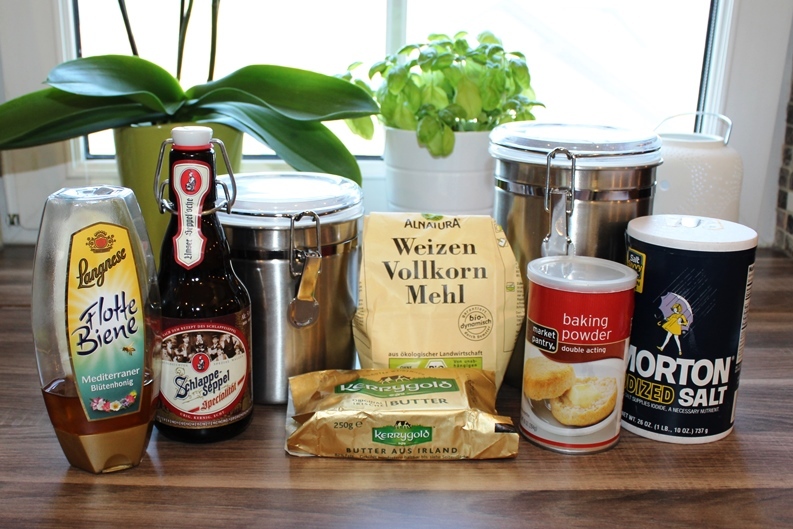 Combine the dry ingredients in a large mixing bowl. 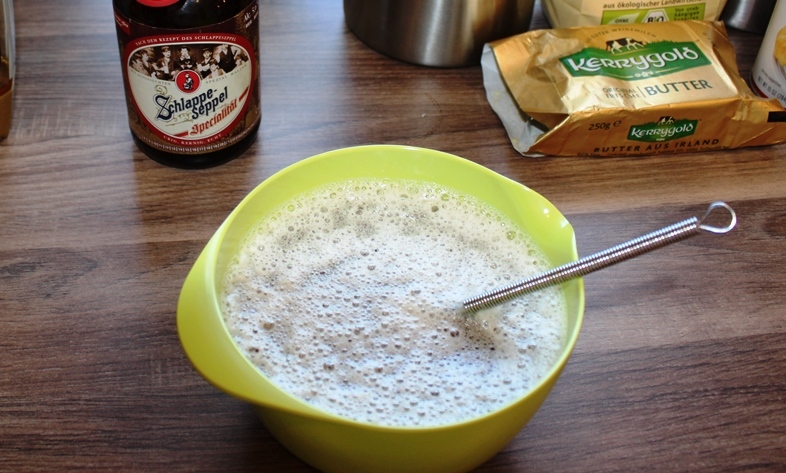 Add the beer & honey mixture to the dry ingredients and stir until just combined. 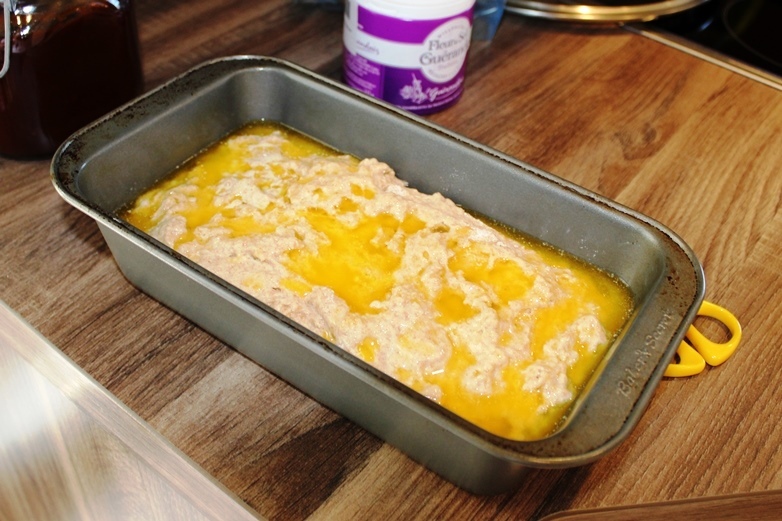 Melt the butter, and then pour the batter into a greased loaf pan. Pour the butter over the batter and bake until golden brown on the top, approximately 50-55 minutes. Cool for a few minutes in the pan, and then a few more on the cutting board before slicing. Enjoy!